A method for effectively collecting solar energy, including disposing solar panels substantially inter-facing each other, and reflecting sun light between inter-facing solar panels. A solar panel, including a first portion adapted to convert sun light into usable energy at a first optimal wavelength and a second portion adapted to convert sun light into usable energy at a second optimal wavelength. A method for effectively collecting solar energy, including using a first portion of a first solar panel to partially convert a beam of sun light into usable energy, and partially reflect the beam of sun light into a second solar panel and using the second solar panel to partially convert the reflected beam into collectable energy. Instead of solar panels facing the sun, pretty soon all the building tops may be covered by solar panel "forest," where solar panels are vertical. By reflecting sun light back and forth among themselves, energy efficiency is improved, and tracking or facing the sun becomes unnecessary. 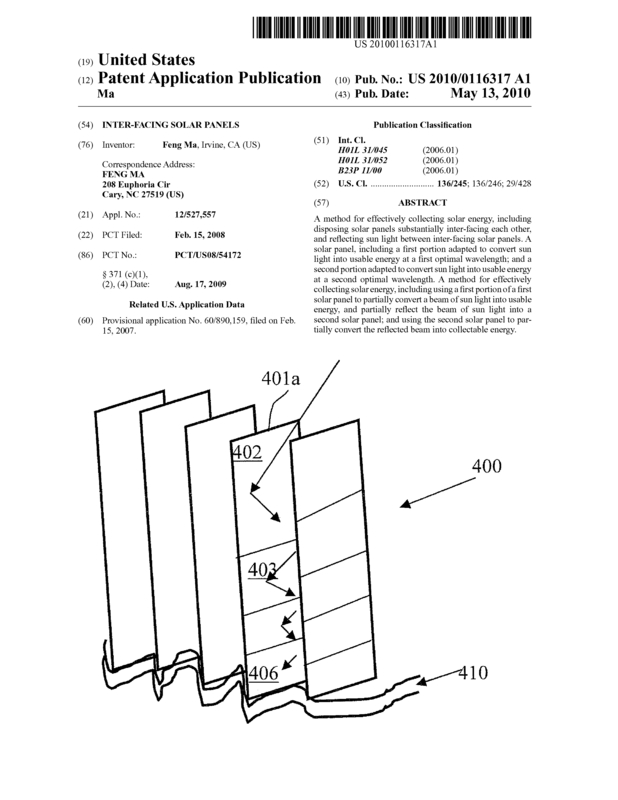 Page created at 2019-04-26 18:46:14, Patent Auction Time.